An excellently rich and compact treat. A small slice packs well in your pocket for instant energy during outdoor sports and adventures. Mix the nut butter and honey together in a medium bowl. Stir in the carob powder, cacao nibs, spirulina and maca powder. Blend thoroughly until the mixture is a shiny chocolate colour and texture. Refrigerate for couple of hours. 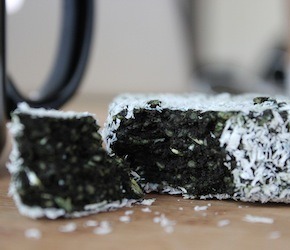 Roll into a log on a parchment paper, sprinkle with shredded coconut and freeze until firm. Cut diagonally into elegant slices.